Every June, we kick the summer off with an outdoor evening on the farm. Inspired by our popular Supper Club, dinner guests will enjoy a gourmet farm-to-table meal prepared by an accomplished chef while dining al fresco on the same land the food was grown on. By attending this dinner, not only will you enjoy a superb meal in a magical setting, but you'll also be helping to support Land's Sake provide Hunger Relief to families in need. We partner with several agencies each year to donate thousands of pounds of fresh produce to those who would otherwise lack access. Drinks: Summer Solstice Dinner is BYOB. Please feel free to bring the beverage of your choice. We will have wine glasses and bottle openers. Meals: Mother Nature reserves the right to modify the menu as needed. We will do our best to accommodate dietary restrictions. Tickets: $130 Member/$150 Non-Member. Included in the cost of each ticket is an unrestricted donation of $50 for Members, $70 for Non-Members to help in this and all of Land's Sake's endeavors. We thank you for your support! Cancellations: Because seating is limited and food is purchased in advance, all tickets are nonrefundable. In the event you must cancel, you may give your tickets to a friend. Please contact Land's Sake with the names and contact information for your replacement guests. You may also contact Land's Sake if you'd like us to give your tickets to someone on the waitlist. Please note there will not be a rain date for the event, but a tent will be used in the event of inclement weather. Chef: Jeff Pond, the Executive Chef of Area Four. Jeff has been on the Boston restaurant scene for more than a decade and believes that the best dining experiences are the most relaxed - casual, high-quality ingredients presented in a true, simple way. Our fall fundraising dinner is hosted on the farm to reinforce the connections between you, this special place, and all that Land’s Sake does. 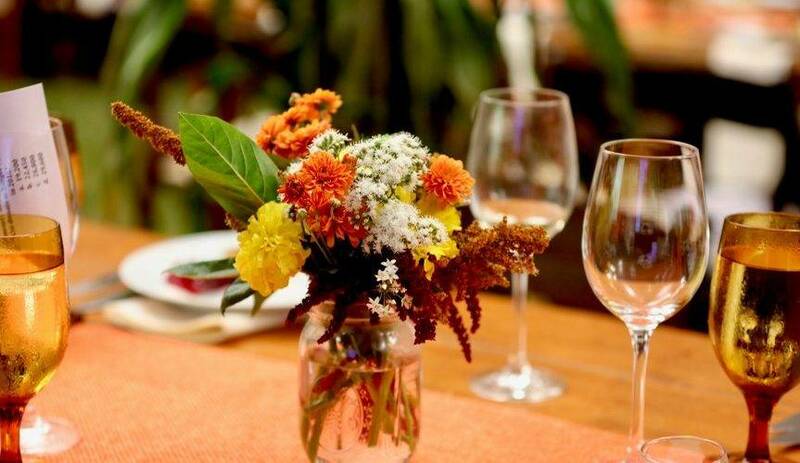 Feast on a delicious farm-to-table meal by Forklift Catering, listen to live bluegrass music, bid on homemade pies and fine wine, enjoy dancing with delicious late-night snacks, and celebrate community with close friends in the beautiful fields. Leadership Packages are available now! Sign up here to reserve your table. Tickets to the dinner sell out quickly, so we encourage you to donate at a leadership level to secure your seats right away. Individual tickets will go on sale in August. Included in your ticket is a donation, which may be tax-deductible, to help support all of Land's Sake's programs and farming in the heart of Weston. Individual Tickets: $250. Included in your ticket is a $50 donation that helps support all of Land's Sake's programs and farming in the heart of Weston. Tickets are non-refundable, but transferable. To find out when tickets go on sale, you must sign up for our general mailing list. Thank you to our Harvest Dinner Sponsors! To find out when tickets go on sale, you must sign up for our general mailing list. Our Supper Clubs are farm-to-table dinners that gather 44 guests. Guests typically include supporters of Land's Sake as well as farm to table enthusiasts from Weston and surrounding towns and Land's Sake Staff. We hold Supper Clubs to build community and energy around Land’s Sake’s mission, to share passions for local food, and to have fun. Dinners usually feature vegetables that are available from Land’s Sake, paired with other ingredients that are chosen and sourced by the guest chef. Where: The dinners take place at Josiah Smith Tavern, a beautiful historic building, where people sit around one communal table. The street address of the Josiah Smith Tavern is 358 Boston Post Rd, Weston, MA 02493. When: We typically have two to four dinners per year. Tickets go on sale a few weeks before each dinner. People gather at 7 pm, drink wine, eat passed appetizers, and socialize. The sit down dinner starts at 7:30 and is usually over around 9:30 pm. Drinks: Supper Clubs are BYOB. Check back soon for 2019 Supper Club dates! To be notified of when tickets for future Supper Clubs are available sign up for our general mailing list.